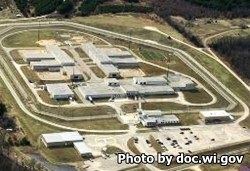 Redgranite Correctional Institution is medium security institution located in Waushara County Wisconsin. The facility houses approximately 1,030 male inmates. Offenders at Redgranite Correctional Institution are secured by two razor ribbon security fences equipped with shock/knock-down electrical technology, an elevated armed guard post, and two armed perimeter patrol vehicles. Additionally, this institution utilizes electronic detection systems and a variety of security cameras. Inmates at Reggranite Correctional Institution are allowed three visits per week, only one of which may be on the weekend. The visiting week starts on a Monday and ends on Sunday. All visitors may arrive up to ten minutes prior to the start of the visitation period. No visitor will be processed in to visitation during the final hour of visits (processing stops at 7:30pm on weekdays and 2:30pm on the weekends). The visiting hours at Redgranite Correctional Institution occur on Monday through Friday from 2:15pm-8:45pm and on Saturdays, Sundays and Holidays from 8am-3:30pm. Visits are two hours in duration. For more information read the Redgranite Correctional Institution Visitors Guide here.